Each comic book/graphic novel is published as a paperback (landscape dimensions 11.8” x 7.75”). The story focuses on Farlaine the Goblin, a tree goblin and a shaman from the forest of Fin-Din. He has spent years wandering the many Oddlands of Wug in search of a forest that he can call his own. Farlaine has two companions. The first is Ehrenwort, a tree he carries in a sack on his back; Farlaine also talks to Ehrenwort, whom he describes as his “Verdan.” The second companion is a “Tink” from an earlier adventure in the “Tinklands.” A rotund, mechanical fellow (think Star Wars' BB-8 with two wheels), he has been named Drowsy by Farlaine. Farlaine the Goblin: Book 5, Vaultlands begins as Farlaine, Ehrenwort, and Drowsy leave the Twistlands behind. Now, it is on to the next land as Farlaine continues his search for a forest. Welcome to the Vaultlands! The first person the trio meets is Jabs Jibber, Vaultlands realtor and guide, but he seems like scam artist. Farlaine and friends discover a land full of... well, vaults. There are vaults the size of post office boxes (and stacked like them, also) to ones that look like lock boxes. The deeper they go into Vaultlands, the more diverse and stranger the vaults become, and farther still, they are older, larger, and more mysterious. There is a treasure hunter to meet and also a creature with a taste for one of the crew, but will Farlaine finally find that forest? THE LOWDOWN: After reading Farlaine the Goblin, Trade Paperback, Volume 1, which collects the first three graphic novels in the series, I was surprised that a comic of such high quality could not find a publisher, forcing the creator to self-publish it. After reading the fifth issue, I am still surprised that Farlaine the Goblin is not a huge hit and a multiple Eisner Award nominee. 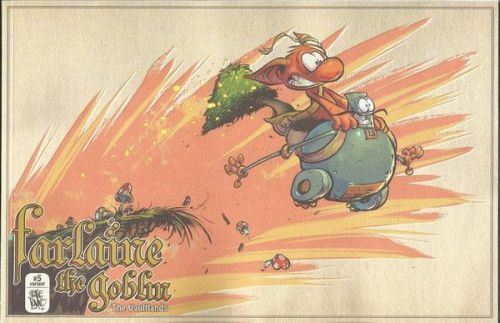 I wish I could say that the best thing about Farlaine the Goblin: Book 5, Vaultlands is the Uncle Scrooge reference, but the truth is that there are so many “best things” about this delightful edition of a fantastic series. Farlaine is a fantasy adventure. It is epic fantasy on a small, but no less engrossing scale. Farlaine the Goblin is in the spirit of the Looney Tunes and Lewis Carroll, and Book 5, The Vaultlands epitomizes all of that. The Vaultlands is funny and inventive, delightful and inventive. How the hell can a land full of vaults deliver so strongly as it does on whimsy and wonder? Maybe, it is the magic of Pug's beautiful black and white art that recalls classic illustrated books for children from the 19th and early 20th century. I could see Farlaine and company at Toad Hall. I highly recommend Farlaine the Goblin: Book 5, Vaultlands and this series in general. I READS YOU RECOMMENDS: Fantasy readers of every age will want to try the imaginative, all-ages Farlaine the Goblin books.